Flint Michigan is a famously afflicted city. Famous, because of Michael Moore’s film “Roger and Me,” which details the systematic betrayal and abandonment of the city by its major employer, General Motors. It has fallen into steep decline since, with massive house leaving, epidemic arson, torturous crime rate — your regular rust belt nightmare. Stephen Zacks, a New York City based writer, is a native son. He’s set up a public art program there as a giveback to his boyhood home. We lit out for Flint from Milwaukee late in the day. We still hoped to make it by nightfall… Fools, we’d believed the online travel times (Michelin and Google). 1) You don’t take 94 through Chicago, you take 294, the ring toll road through Cicero (it’s still a hairy hourlong ride with heavy trucks, but at least you’re moving); 2) Michigan time is an hour ahead of Wisconsin. Our hopes of arriving for the Flint Art Parade were quickly dashed. Stephen Zacks, our host, had also scheduled my talk for that night, not the next day as I’d thought, and that was not going to happen. We made it to a chain motel outside Battle Creek, which appeared to be run by ex-junkies, in a room spittin’ distance from I-94, which serenaded us all night. Dinner was at Denny’s, the 24/7, with a gallery of weird Americans sauntering, hulking, wheeling in and out. We arrived in Flint the next day, and Stephen gave us the tour of his public art projcct. The office is in a downtown building that served once as an all-ages music venue, and today has numerous other leisure and service offerings. We met the project’s young French architecture intern. 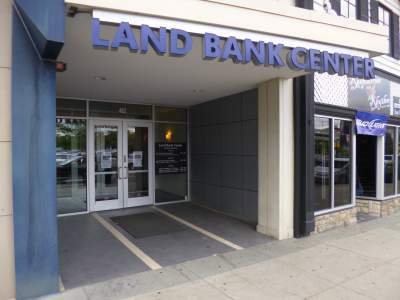 Flint has a Land Bank run by the county, an office building downtown which hands out abandoned properties to those who show they might make something of them. Stephen has two — one, a living space and planning center for those working on his public art project, and the other a painted decorated supply shed. Other houses nearby are abandoned, painted on, and squatted. Two had been recently burned, and neighbors were pitching in to help clean up one of them. We were invited inside to see the fine 19th century decor of the house by two guys who seemed too old to be doing the heavy demo cleanup they were doing… but Michigan grows them hardy. An old comrade, the artist GH, had built a white spiral construction supporting a chute-like form for this year’s project. The city building department had taken umbrage, insisting it come down. Stephen was circulating a petition to save it in the neighborhood. We met the mayor, then a couple of local machers standing in an open-air gallery of bronze figures depicting town heroes of the modernist era (e.g., Mr. Chrysler, and others more familiar as brand names). We saw the GM heir who runs a foundation hustling down the street, talking on his cel phone, on his way to his office in the town’s only high rise. Stephen described the lay of the funding landscape. He is doing what he can in a country that basically doesn’t believe in art, nor understand art and artists. Nothing much can be done about that, I think; but I am wondering what I can do in Flint when I next return to that challenging city.